Its consistent usage can really impress goddess of wealth as per Hindu believes. Yes, it is true! as we have used special Ingredients that are adorned by Goddess "Lakshmi", monetary benefits are likely to come your way. You can reap the fruits of your good works easily as from now on, "Lakshmi" is there for your help. 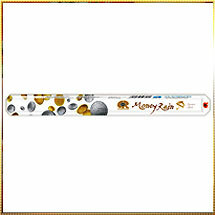 You can easily enjoy the showers of her blessings by the consistent use of our Incense Stick, promoted in the market under the brand name "Money Rain". Apart from this, fragrance of this collection is truly enchanting and when it comes to the lingering effect, it is counted among the best.